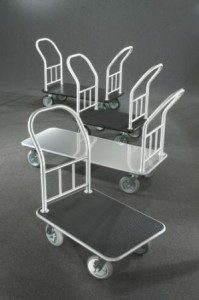 Glaro Inc. recently launched a new Glaro Glider line of platform carts. Designed to be durable but attractive ”work-horses,” the new platform carts are built strong for the hospitality and healthcare industries, industrial settings or for use anywhere. They operate at the same level as Glaro Glider bellman carts while outperforming standard platform carts currently on the market. They are also some of the most aesthetically pleasing designs ever developed. Sanitary, slip resistant, and easy to clean, black and grey coin design PVC deck coverings have a tough, durable surface that is wear resistant and non-slip. Slightly raised embossed circular patterns help stabilize cargo during transport. In addition, vinyl deck coverings are non marking. They will not damage or scuff the products or cargo placed on the platform cart. Steel decking is available in your choice of tough silver vein or black powder coated finishes. An additional 27 powder coat finishes are available upon request. Steel decking is known in the industry as a hearty, rough and tough surface. In fact they are the hardest deck covering available on platform trucks and the first choice for strictly utility use both indoors and outdoors. They are scratch and chip resistant and are easily cleaned. Because they have a powder coat finish they can match almost any décor in any building. Satin polished aluminum decking provides a very hi tech, sleek, more modern look than other deck coverings. They will not rust and they are easy to clean and sanitize. A heavy clear powder coating is baked onto satin polished sheet to match the cart’s standard satin aluminum handle. This decking option provides the most uniform appearance between the deck and its handles. Aluminum decks are non-magnetic. They do not absorb and retain as much heat as steel. Finally, on any metal finish or carpet, high quality silk screened custom logos or messages can be added to any platform cart or platform truck. Between these four deck covering options and a number of other decorative options (click here for the downloadable platform trucks brochure), virtually any cart can be manufactured to meet your needs. If you are a dealer in the industrial, hospitality, building management, educational, or janitorial industry online or offline, adding these new platform carts is a great way to bring to your customers superior form and function at competitive pricing. More detailed information can be found on the official Glaro Inc. website: www.glaro.com or by calling (631) 234-1717.